The kids will never know! Best of all, it’s made in your slow cooker! Don’t let the list of ingredients discourage you, it’s well worth it. Serve over you favorite pasta. In a food processor, process vegetables (separately) until fine, almost a paste. Melt butter and olive oil in a medium saucepan over medium heat. Stir in the carrots, bell pepper, celery, onions, and garlic, cook until soft, about 10 minutes (you want this super soft). Add chicken stock and wine and cook another 10 minutes until reduced by 1/4. Add spinach, mix well and remove from heat. In a slow cooker place heat on high. Add cans of tomatoes, sauce, half of the cooked vegetable mixture and all dried spices, salt, pepper and sugar. Cover and bring to a boil. While you are waiting for sauce to boil, soak bread in milk in a shallow dish. In a stand mixer, crumble meat, add soaked bread, the egg, the remaining half of the vegetable mixture, the parmesan cheese, salt and pepper to taste. Mix on high speed for 2 minutes until slightly whipped. (I find whipping the meat makes a light and airy meatball). 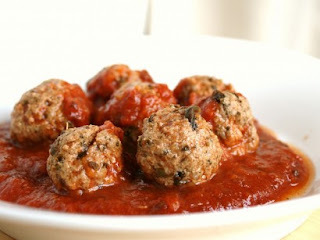 Roll meat into 1-inch balls, drop into boiling sauce, place heat on low and cook 4 to 6 hours. Serve over your favorite pasta. The list of ingredients sound so delicious they would ENCOURAGE me to make this! Nicely done! I don't usually "hide" the veggies, but meatballs is one of my favorite ways to sneak some extra veggies in. Nice post!